This is a scoping project developing the necessary framework to allow on demand, real-time attribution studies of floods in the Brahmaputra basin. This scoping project will develop the necessary framework to allow on demand, real-time attribution studies of floods in the Brahmaputra basin. 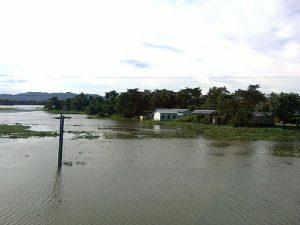 The human influence on extreme weather events that lead to such floods, thereby affecting freshwater supply in Bangladesh, will be quantified. This knowledge will be used to provide inputs to the “Loss and Damage in Vulnerable Countries Initiative” initiated by the Government of Bangladesh and the Least Developed Countries. The project’s activities will develop the mechanism for real-time event definition, automated simulation ensemble launching and preliminary analysis. Building on the existing work of the Climateprediction.net and Weather@Home citizen science projects, the computational resources attached and utilised will be provided by the Google Cloud Platform. Application of the cloud will enable both scalability and costs to be determined for a future production system run by a Bangladesh Government institute such as Department of Environment or Department of Disaster Management (DDM).